Ever had a sudden urge to peer through a giant kaleidoscope? Now you can! 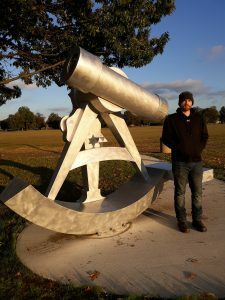 The latest permanent public sculpture, titled simply Kaleidoscope, is designed and built by UA art alumnus and foundry specialist Eric Nubbe, and has been installed by UA Art Foundry at Snow Hinton Park in Tuscaloosa. 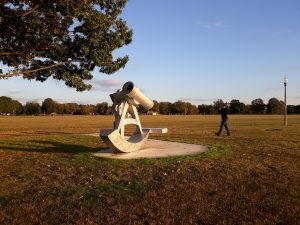 Commissioned by Tuscaloosa PARA, the seven-foot-high aluminum sculpture is a working, interactive kaleidoscope, perched at the northwest corner of the park. 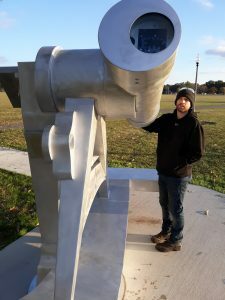 Since kaleidoscopes are shaped like a simple tube, Nubbe decided to make the massive optical instrument more interesting, so he chose the shape of a sextant – another viewing instrument which sailors have used to navigate the seas for hundreds of years. The kaleidoscope looks northwest into the sky over Tuscaloosa and the mirrors inside the kaleidoscope reflect whatever the skies look like on that day. 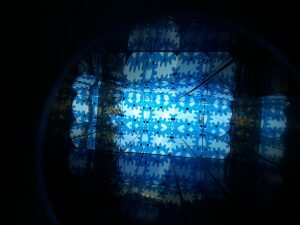 In many kaleidoscopes, loose pieces of colored glass inside the tube are mirrored into symmetrical and colorful patterns as you turn the scope. Nubbe decided to add something similar to his. Instead of just looking up into refracted reflections of the sky, viewers look through translucent blue Plexiglas gears that Nubbe cut [on?]. 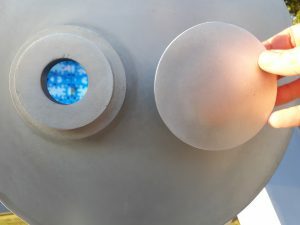 When visitors look into the viewer, they rotate a disk just to the right of the scope, and the disk turns the blue gears inside, creating beautiful blue patterns across the sky. 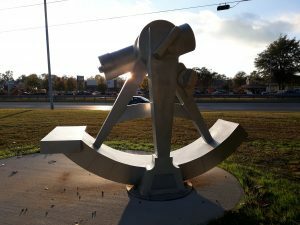 Eric Nubbe’s Kaleidoscope is part of a Public Art Project commissioned by the Tuscaloosa County Parks and Recreation Authority to put art in parks around Tuscaloosa County. Giant steel flowers created by student artists Ringo Lisko and Amber Daum were installed last year in Monnish Park as part of the same project.